A superb writer. . . If Raymond Chandler had grown up in Northern Ireland, the Sean Duffy series is what he would have written. 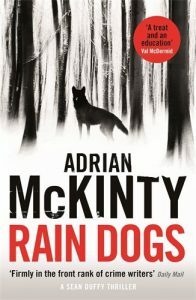 McKinty, who grew up in Northern Ireland, has an ear for language and a taste for violence, and he serves up a terrifically gory, swiftly paced thriller. A roller coaster of highs and lows, light humour and dark deeds, the powerful undercurrent of McKinty’s talent will swiftly drag you away. Let’s hope the author does not slow down anytime soon. McKinty is a storyteller with the kind of style and panache that blur the line between genre and mainstream. Adrian McKinty is fast gaining a reputation as the finest of the new generation of Irish crime writers, and it’s easy to see why on the evidence of The Cold Cold Ground. Hardboiled charm, evocative dialogue, an acute sense of place and a sardonic sense of humour make McKinty one of our greatest crime fiction writers.